Myrtle Beach National SouthCreek course is an Arnold Palmer gem that winds through a magnificent setting of coastal wetlands and hardwood forests. Most golfers find SouthCreek to be the “finest” of the three golf courses at Myrtle Beach National. At just over 6,400 yards from the back tees, SouthCreek requires less distance but greater accuracy. Numerous waste areas and well-protected bentgrass greens place a premium on your course management and shot-making ability. 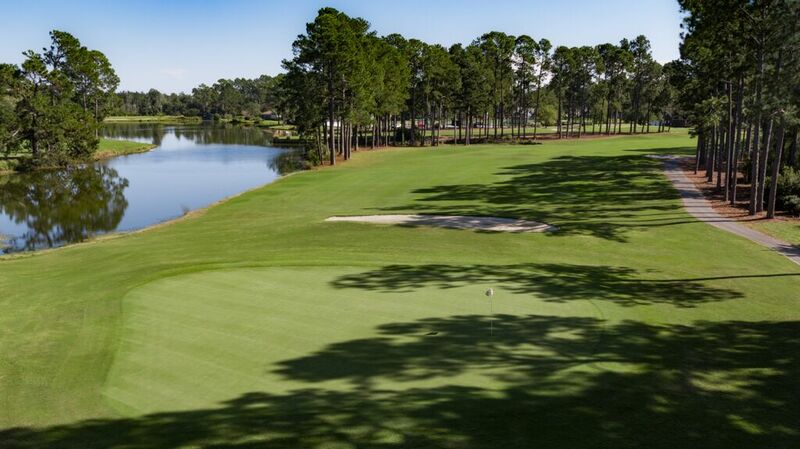 The Myrtle Beach National Southcreek course is a wel-rounded array of golf holes. Some highlights of the course included the reachable par five 6th hole. Two solid shots put you in position for a chance at either birdie or eagle, keeping the ball down the middle is the key to this hole. In contrast, the par five 10th hole is a completely different endeavor. A very severe dogleg to the right, prohibits reaching this green in two shots, as does a lake bordering the hole’s right side. A manageable third shot is possible after a smart opening shot and lay up. The finishing hole is a great chance to finish up a round with either a par or birdie. A slight dogleg left, this par four is only 380 yards from the back tees. Clearing the dogleg, you are left a short approach shot into the green. The clubhouse provides a dazzling backdrop as you play your last shots of the round. SouthCreek provides its own unique round of golf, distinctly different than the other Myrtle Beach National courses. In 2004, this spectacular blend of national and man-made challenges was voted among the “Top 100 in America” by Golf for Women.